You may be required to collect taxes for certain goods and services you offer. QuickBooks helps you keep an accurate record of these taxes so you can easily monitor and remit them to the appropriate tax collecting agency. If your taxable sales amount seems off when you run the Sales Tax Liability report or if you have invoices from another month or period showing on the current report, then you may need to check if you are running the report on cash or accrual basis. Note that the accounting method or report basis you use affects the sales tax amount you owe. Accrual: QuickBooks calculates sales tax payable as soon as you invoice your customer. Regardless of the payment amount or date, the full sales tax amount will show on the month when the invoice was created. 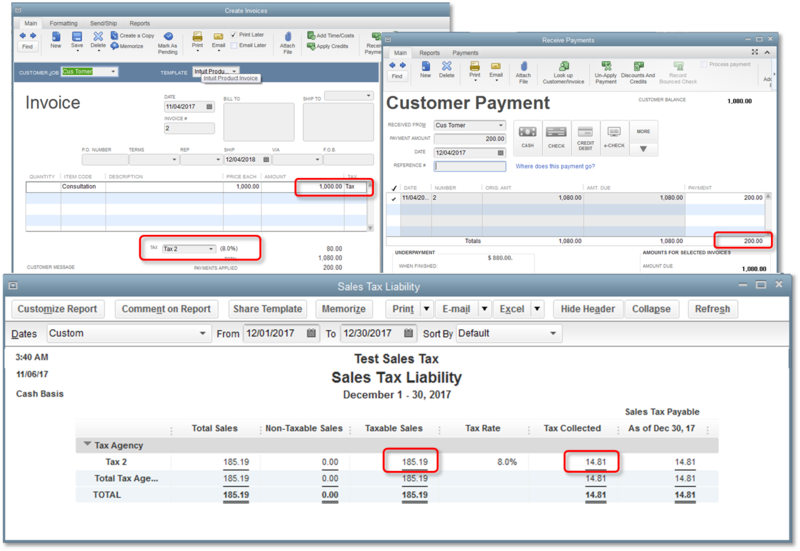 Cash: QuickBooks calculates sales tax payable only when you receive the payment. When you receive a full payment for the invoice, the full sales tax amount will show on the month when the payment was received. No sweat! It becomes complicated, however, when there are non-taxable line items on the invoice or if you receive partial payments or if there are credits/discounts applied to the invoice. Here are some of the common scenarios you may encounter when you receive partial payments for cash basis sales tax. If you create a completely taxable invoice and receive a partial payment then sales tax amount shows on the month when you receive the partial payment. 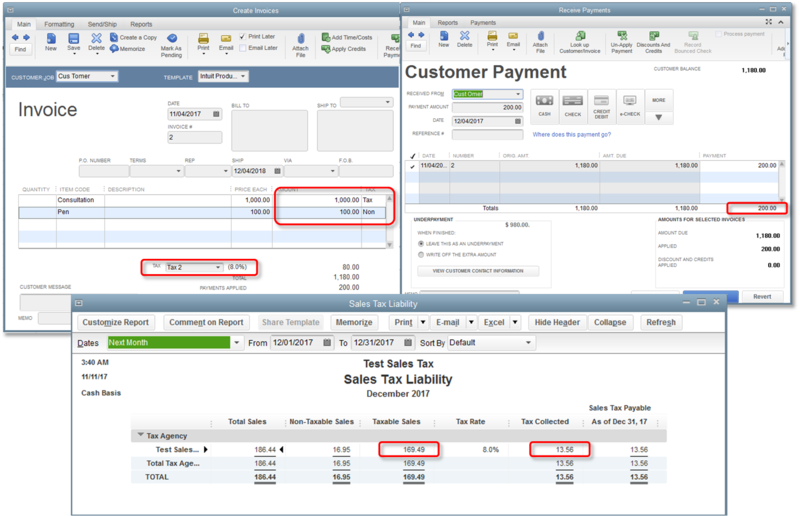 QuickBooks applies the payment to the taxable sales and then reverse calculating the sales tax to be paid. To calculate the taxable sale amount, divide the payment collected by 100 plus sales tax rate and then multiply it by 100. To calculate the tax amount, subtract taxable sale from the payment amount. NOTE: If there are several partial payments, you can add up all payments made against the invoice and use the same formula for calculating the total amount of taxable sale and tax collected. If you create an invoice with a non-taxable item and partial payment, then sales tax amount shows on the month when you receive the partial payment. QuickBooks calculates the taxable sale by applying the payment percentage to the total amount of taxable item. To calculate the payment percentage, divide the total payment received by the total amount due. To calculate the taxable sales amount, multiply the taxable item amount by the payment percentage. To calculate the tax amount, multiply the taxable sale by the tax rate. 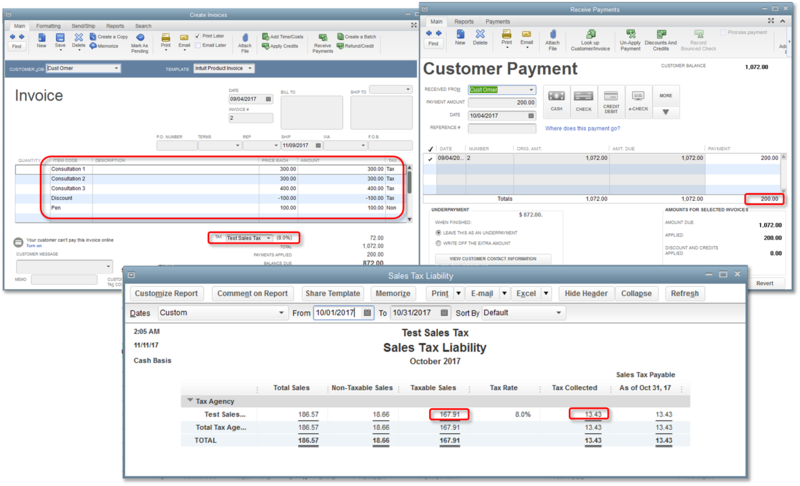 If there are multiple taxable items on the invoice, QuickBooks multiplies the payment percentage to each taxable item. If there are several partial payments, you can add up all payments made against the invoice and use the same formula for calculating the total amount of taxable sale and tax collected. If you create an invoice with a non-taxable item and an applied discount/credit and you receive a partial payment, then sales tax amount shows on the month when you receive the partial payment. QuickBooks calculates the taxable sale by applying the payment percentage to the total amount of taxable item.